So then I started pulling out that blue waste yarn and picking up the live stitches left behind. As usual, I thought this was going to be really difficult and that I would be dropping stitches left and right. But it was easy. I just worked my way across slowly. 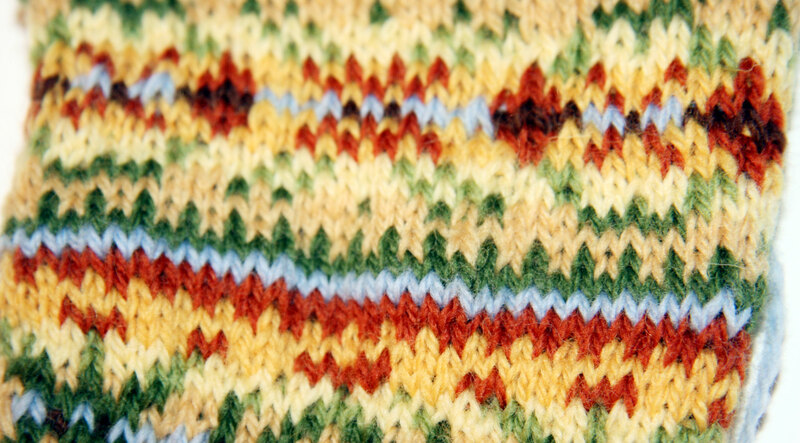 Now I’ve picked up all the stitches and have arranged them onto 4 needles. 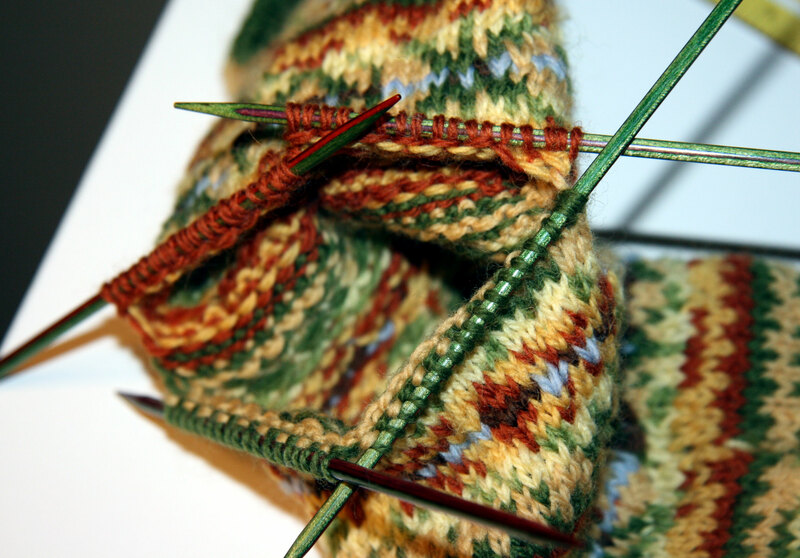 From here, it’s just knit for 5 rounds and then start decreasing just like a toe. So easy! Here’s the finished sock. When I finish the second one, I will put them on for photos. But this sock fits great. I am so happy with the tension. It slipped right on. I was also pretty happy with how the inside of the sock looks. Pretty darn neat and tidy! There one thing bugging me about the first sock. 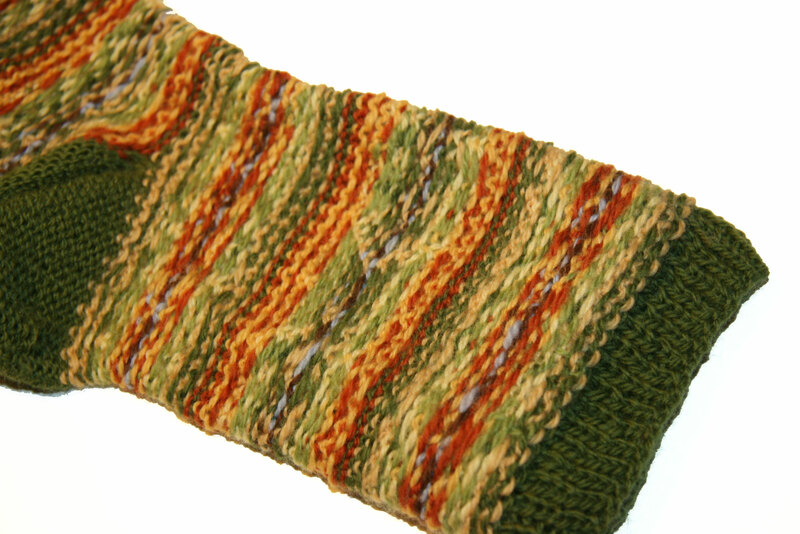 There is a seam running up the side where I changed colors of yarn after each round. It looks ok, but it could be better. Not all the stitches line up quite perfectly. I think this will work better if I try to just carry my yarn up as much as I can. I’d cut the yarn in places where I knew I was going to be carrying it up unused for quite awhile. I think things may hold together better along the seam if I don’t cut so much this time. All that yarn starts to drive me nuts though, and finally I just can’t help myself and I find myself just cutting strings to get them out of my way! Whoa! That’s enough about one sock! Still hot. We had big thunderstorms last night. I don’t know if we had more than 85 drops of rain (as my dad likes to say), but I got to listen to lots of great thunder. I guess when it’s this hot, the lightning really gets going. I was driving down the interstate yesterday, and my car thermometer said 107 for awhile. I was afraid that my tires were going to melt right into the highway. Ok Davey just came flying down the hall: “I tinkled! I tinkled!” Time to go award a sticker! 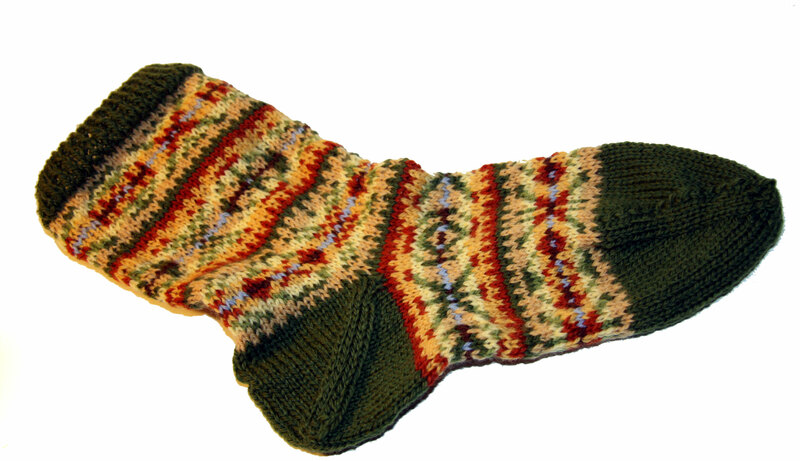 This entry was posted in Uncategorized and tagged afterthought heel, boyfriend sock, fair isle, Joy of Sox, sock by cpeezers. Bookmark the permalink. Love the new sock. I don’t know how you do it. I mean, you showed how you did it, but still…..I was never any good at knitting. Never tried anything but a scarf. Keep posting, and congrats to the tinkler ! I’ve never done an afterthought heel. Your sock is making me want to rectify that. High five to the tinkler! Oy those ends! I find when I weave them in carefully, I can correct the “seam” that shows by weaving them along the round that matches the yarn. As you know, circular knitting is really a long spiral, so breaking the yarn and weaving it to the correct “round” can help… a bit! Love your colors, and I really like the light blue waste yarn between the plain red and green rounds….might have to do that some time! I agree with Mary Jane. 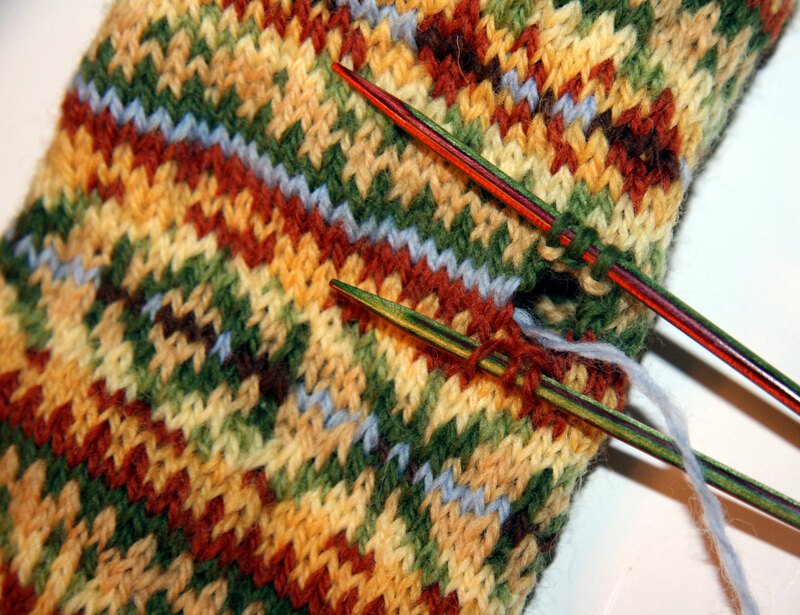 A little thought on the placement of the ends when weaving them in can help to line everything up. Your socks are beautiful. 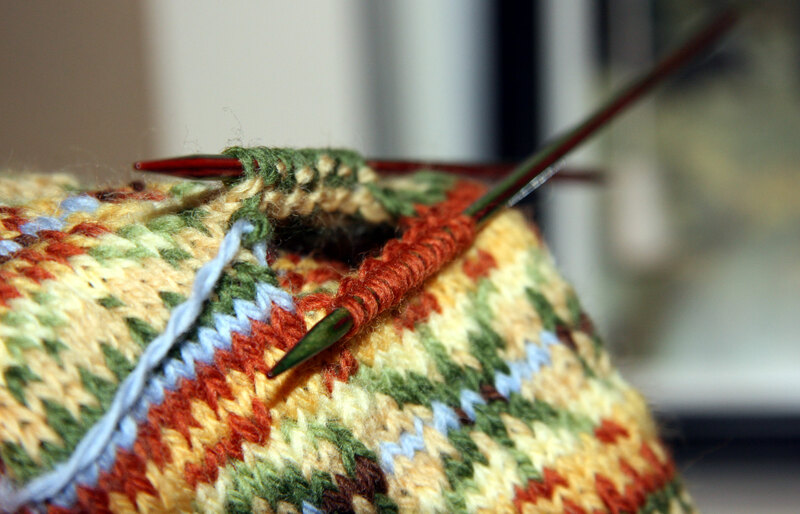 I’ve done a lot of socks with different heels, but I’ve never attempted an afterthought heel. Thanks for the clear tutorial. I’ll have to give it a try.